Most people who know me know of my hatred of cooked vegetables. Unless you count corn and potatoes, which are more like starches, I don’t eat any cooked vegetables at all, ever. Oh, Dave sometimes purees some carrots and sneaks them into the spaghetti sauce, and I make carrot oatmeal muffins, but that’s really as far as it goes. But I do remember Mom making zucchini bread when I was a kid, and I liked it. So I’ve had my eye on some healthy, Weight Watchers-friendly recipes for a while, but I wasn’t ready to commit. But today, my friend Marcie had some extra zucchini sitting around (thanks to another friend who had even more zucchini sitting around) so she sent me home with it, along with some other interesting ingredients and some bagels from that great bagel shop in Rye. And there the adventure began, as I have never in my life baked with zucchini before. I don’t eat zucchini at all. Ever. Nor would I. Blech. 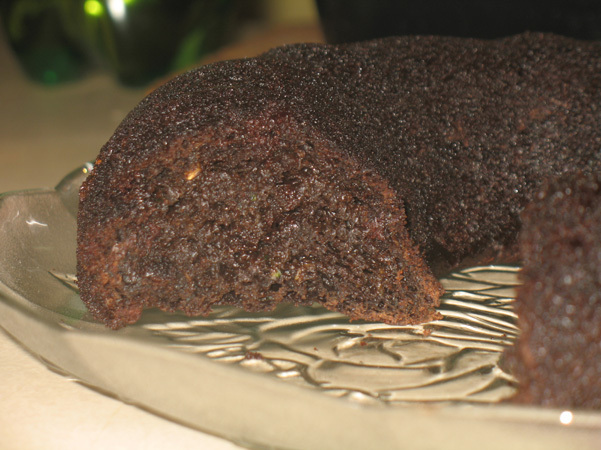 I combed through Pinterest, food sites, blogs, and Google search results to find a healthy recipe, it’s amazing how many chocolate zucchini breads are loaded with sticks of butter. 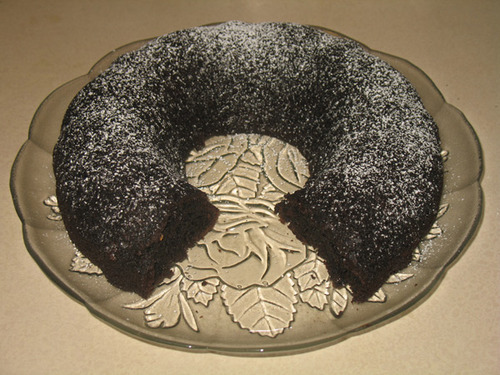 I finally settled on this one: Secretly Healthy Chocolate Cake. My first mistake was using the Microplane on the zucchini. Thank goodness I was on the phone with my Mom at the time, because she rescued me from my own folly. “Don’t use the Microplane!” she said. I looked down at the bowl. She was right. It was a mushy mess. 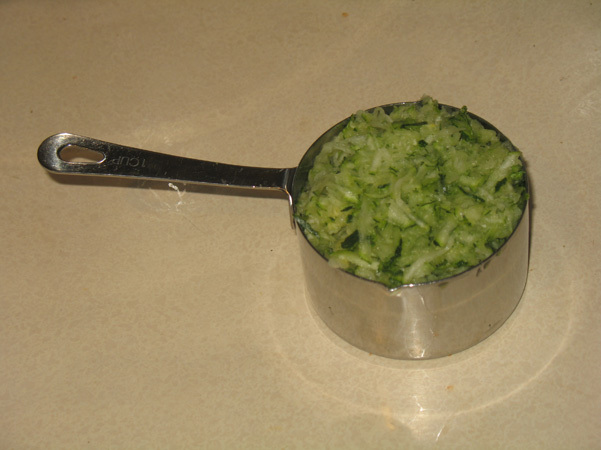 I was down one zucchini, and glad I hadn’t chosen a recipe that needed more than a cup of it. I took her advice and switched to our box grater for the last zucchini. I grated. Thanks Mom! Phew! This had to be what the recipe intended. Dry ingredients were gathered. 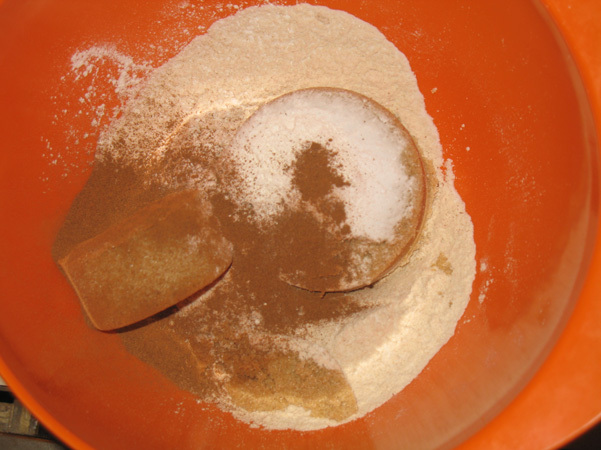 I used whole wheat white instead of mixing up the white & wheat flour, and stuck to the recipe for the brown sugar, baking soda, baking powder, and salt. The recipe said to use 1/4 teaspoon of cinnamon, so I thought I’d put in a teaspoon, but I randomly and foolishly decided to pour the cinnamon over the bowl, thus spilling more than I intended directly into the other ingredients. Oops. So to counteract any potential cinnamon overdose, I added 1/4 teaspoon of espresso powder. Then I whisked it all together with gusto. 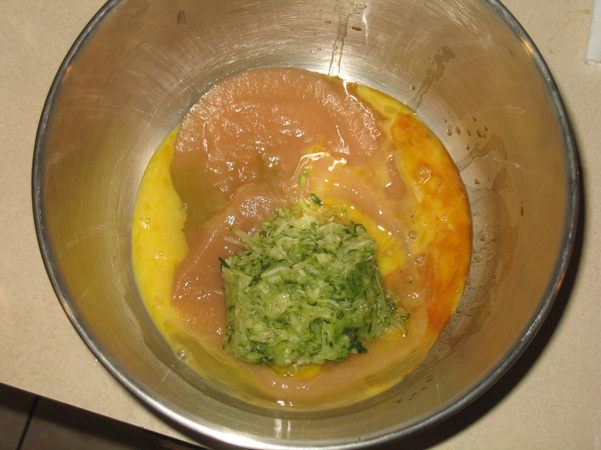 Now the recipe said to just add the rest of the ingredients, but I decided to mix them together first. Applesauce and vanilla went into another bowl. 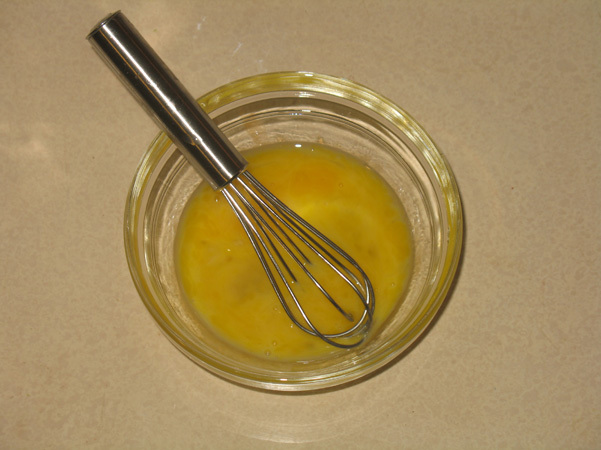 I needed one slightly beaten egg, which finally gave me a reason to use the teeny, tiny little whisk that came with a set I found on sale on Amazon. 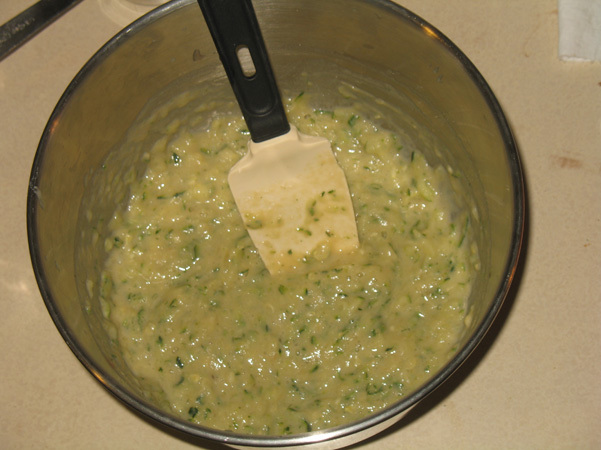 I added the egg to the applesauce and vanilla, then plopped in the zucchini. There’s no other word for it. I tried pouring it but it just plopped out in one big PLUNK. I stirred it together and tried not to shiver. I really do hate zucchini. I hate applesauce too. Raw egg doesn’t really appeal much either, so it’s really just the vanilla that wasn’t creeping me out at this point. 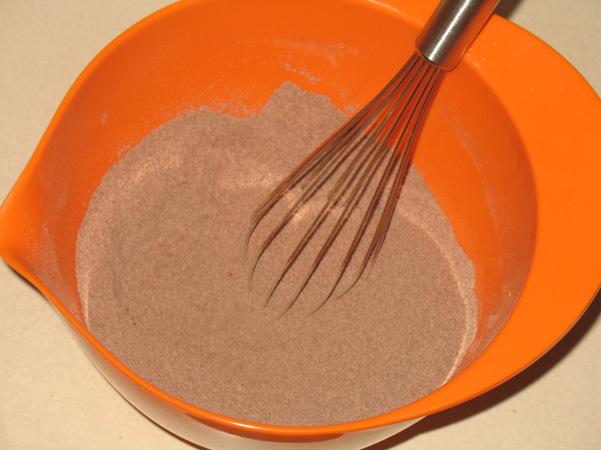 I hurriedly added the cocoa powder/flour/sugar mixture. Now there are some ingredients I can get behind. And lo and behold, when combined, everything started to look normal again. 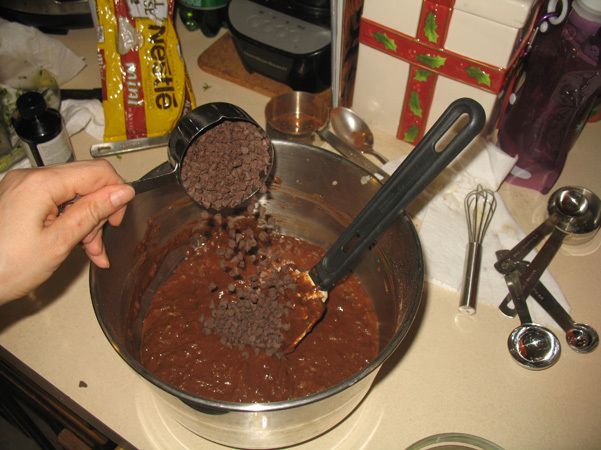 I had a proper chocolate batter in front of me. I added the chocolate chips, opting for the minis. Once combined, I poured it into a bundt pan. 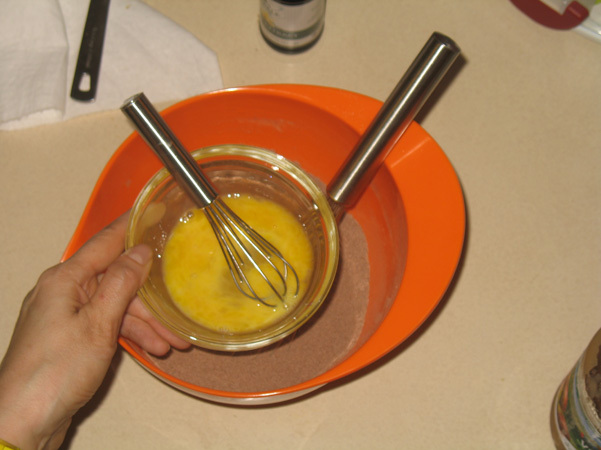 Unlike the Cream Cheese Pound Cake, which fills it up right to the top, this batter came up about halfway. 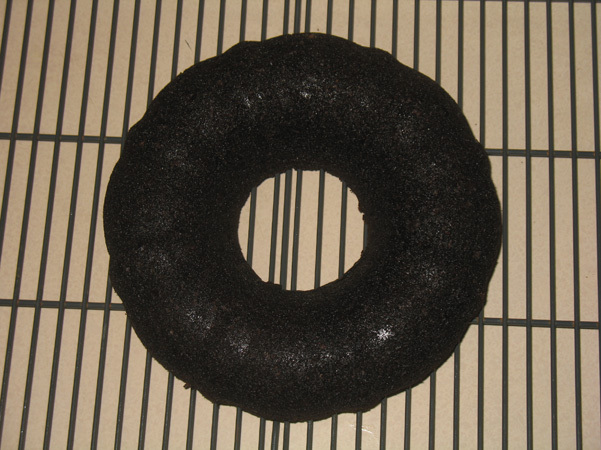 This is only my second bundt recipe, so I’m still in the information-gathering stage. Anyway, I wasn’t worried. 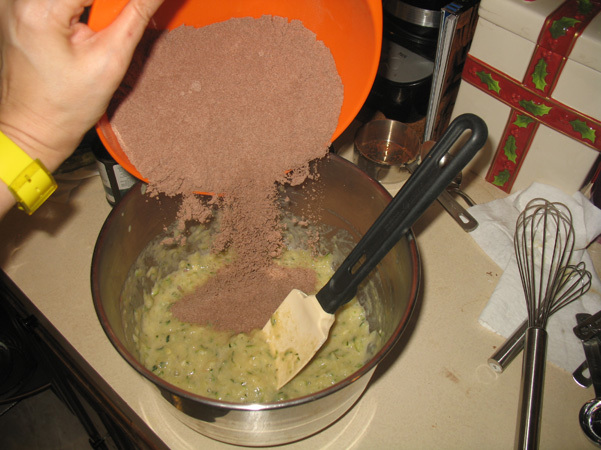 The photo that was on the original recipe made it look about half the height of a full-size cake anyway. The batter in the pan in front of me seemed to match. The splotch on the counter matched too. All was going according to plan. Well…it was, until I put it into the oven. The recipe said to bake for 30-35 minutes. I swear, mine took more than an hour. I kept checking it, poking it with a toothpick, setting the timer for five more minutes, then repeating the process. At 30 minutes it was still just batter. Eventually it started to firm up, but it took almost another 30 to get it to the point that I felt it wasn’t undercooked. Dave thinks maybe it’s the pan, because there was so much empty space in it. I think it’s the applesauce. I’m thinking that yogurt would have been better, because applesauce has a tendency to make baked goods overly moist and there was no butter or oil in this batter to offset it. Maybe a combo? Then again, applesauce works great in Oatmeal Tea Bread and that uses a whole lot more of it. I let it cool in the pan for a good 20 minutes so it could finish baking, then turned it over. Plop! Instead of the plop of terrifying zucchini I had the delicious plop of a very very chocolate cake. The color was definitely dark, but not as dark as it looks in my photo, depending on your monitor. No natural light was to be found at that hour since the thing had taken so long to bake. Anyway, I moved it to a plate and cut it open so we could have a look at it. The flavor is terrific. 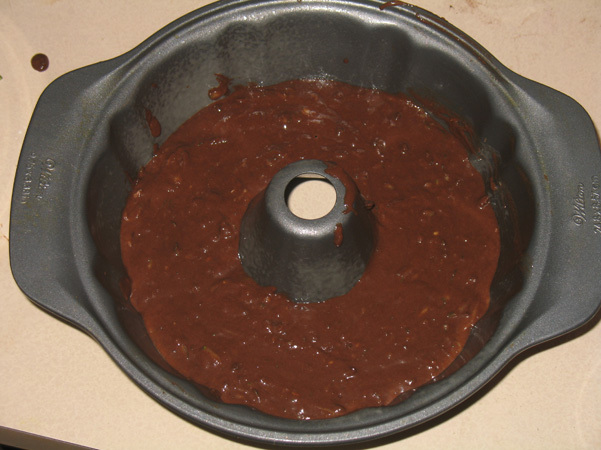 Not a trace of zucchini; nothing but rich chocolate goodness, you’d never think of this is a low-fat cake. That said, despite the look of the crumb, it did have a slightly not-quite-done texture. Well maybe not undercooked, but just a little overmoist n that applesaucy sort of way. It didn’t taste anything but delicious though, and when I came back later to dust it with powdered sugar and put it away for the night, I saw Dave had polished off the chunk we cut out of it. I bet it’s even better this morning, but it’s early yet and I opted for the last Carrot Oatmeal Muffin for breakfast. So…success, I think. 3 P+ for a slice if you divide it into a generous twelve servings, tastes like decadent chocolate cake, and I’m no longer revolted by the idea of working with zucchini. 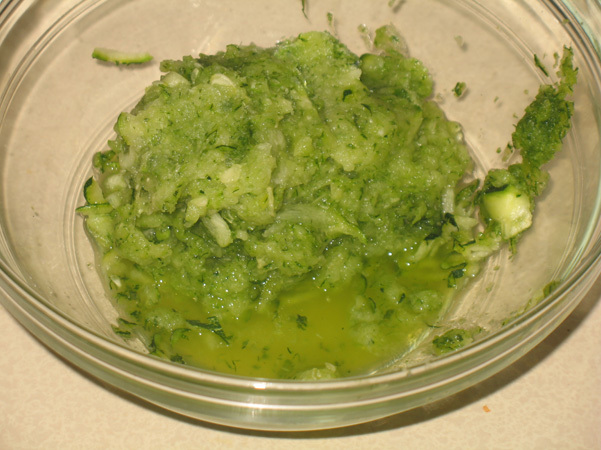 I see many more zucchini experiments in my future, none of which include my Microplane. Nathaniel will like this too! Marcie & Mom get shout-outs for the help, and I’m going to play with this recipe until I get the texture perfect, because the flavor is wonderful. A noble experiment indeed.